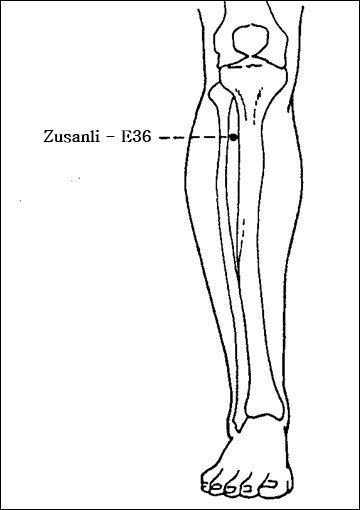 Just as the point of the Liver Meridian H3, which we discussed in a previous post, point Stomach Meridian E36, called Zusanli, Also belonging to calls “Las Doce Estrellas Célestes”. This point has a great capacity toning, bringing their stimulation, either by acupuncture, Acupressure or moxas, causes a large energy input. It is also great for when we feel surfeit, stomach pain or when we need to raise our defenses. It also helps regulate metabolism, point being to work for people who are overweight or underweight. Increase the visual agudeza, holds the diarrhea, strengthens our internal organs and also serves to disorders of the nervous system. 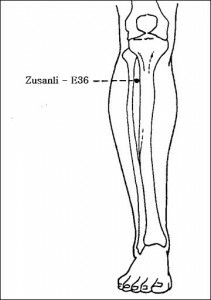 It is located four fingers below the kneecap, en the superior prominencia de la que hace el músculo anterior tibial cuando el pie if flexiona.